If you want to work in UX, at some point you are going to come across IA or Information Architecture. This started out in library sciences looking at how to organise information and books, and has move across to the internet to organise digital information. Although many people think this just means creating a navigation structure it can be much wider than this, going all the way from ordering pages, to what words to use, never mind creating a structure which can take the addition of more information later on as the website evolves. And as with most things connected with UX there is a lot of overlaps with other fields. It can all seem a little overwhelming, which is why you might want to read this weeks book. 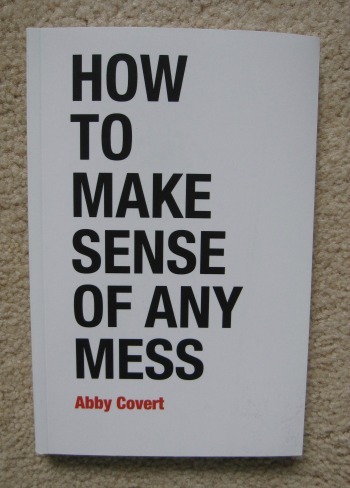 How to Make Sense of Any Mess is written by Abby Covert, the Queen of IA. And as the title suggests this book is not just aimed at people practicing UX or IA, it is aimed at anyone who has a mess to sort out and does not know how to start. It is broken down into 7 chapters where each page of the chapter is a separate lesson. This means you get bite sized chunks of information to process, making it easier to get your head round each idea. It is not a big book, as she says in the introduction "in the time it takes to fly from New York to Chicago, I will introduce you to the practice of information architecture", but the content is carefully considered and laid out to make it a step by step guide with which to work through your mess. Each chapter also includes a story about a person with a mess to sort out, and a worksheet to try out on your own mess. They are only small parts of the book, but they help to glue it all together and clarify the key questions to ask to get a result. If you have a mess to sort out, or are just interested in the subject of IA this is a great little book to get started with.